Hand made Rainbow Vision Sand Art! With each turn, the sand will fall in a different pattern creating new and unique landscapes. Austrian Sand Artist Klaus Bosch created this stunning hand-made Rainbow Vision Sand Art, entitled �Window,� in his Austria studio. With every turn, this sand art picture displays a one-of-a-kind portrait and a unique landscape made entirely of sand. 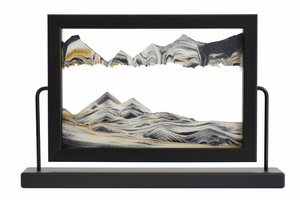 Klaus Bosch sand art makes the picture-perfect gift for your favorite art-lover and can be displayed in your home or office for a mesmerizing, interactive focal point. Bosch Vision Sand Art comes in a variety of different colors - Vista, Black, and Canyon- to match your unique interior d�cor. Check out our video display below to see this sand art sculpture in action. Earthtech Products is no faceless big box store. We take your business seriously and will go the extra mile to help you get answers to your questions. Call us toll-free at 1-877-548-3387 for more information. Bought for husband's birthday. Great gift. Different picture every time! Fascinating and calming to watch! Perfect for the person who has everything, of the creative/artist person. Would definitely buy again! 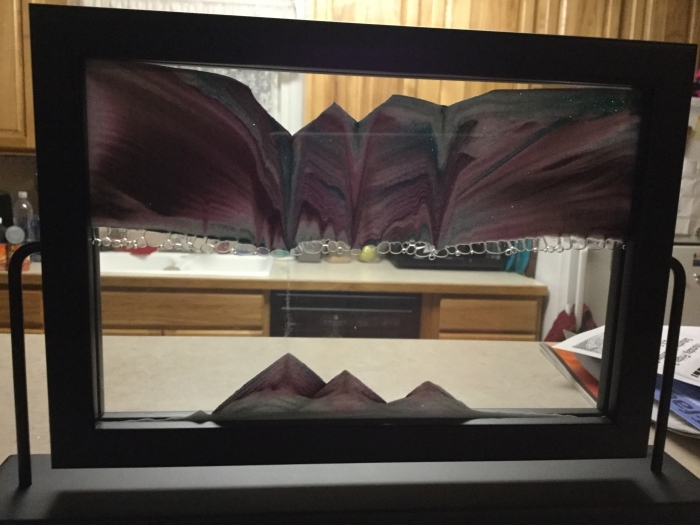 The Sand Art Window makes a great gift for adults who seem to have everything, and those who don't too. This is the fourth one we have purchased for a Christmas present. I also love that they are still made in Austria. ProsFun to watch, looks nice in any room and easy to operate. Best UsesOn a table or desk near a window so the light can shine through, lighting up the different colors of the sand, beautiful. Lovely sand art. Was a gift for my boyfriend. We flip it multiple times a day and like to see the different results each time. ConsGetting the right amount of air is challenging. It's either too fast or too slow. I gave the item as a gift to my wife and she couldn't be happier! It's uniqueness, varying time to create a new, different, splendid image keeps us riveted to the ever-changing image. Thank you! I bought this as a gift for my husbands birthday, he said it is one of the best gifts ever. A new design every time. We watch it for hours. What a great idea! There is extra air and loss of some water....what type of water do I need to add? It is best to use spring water because it is straight from the ground. That being said, any brand name water is fine as well. Thank you for your inquiry! Typically, when the sand is not falling properly it is time to regulate the airflow using the included injector. Please find below a video explaining how the regulation process is done: https://www.youtube.com/watch?v=0WGvfVoy_cY Thank you for your inquiry! What is the difference between the black and the black diamond? And why is it $5 more? The Black Diamond has slightly different color sand and is a limited edition. Please let us know if you have any other questions.